Freez Screen Video Capture is a screen capture & screen recording tool to record screen activities and sounds into AVI video files. You can record any part of the screen's activities and the cursor's movements, using a microphone to narrate your screen recordings. You can choose the output video's compressor (such as Microsoft Video 1, MPEG-4, DivX...) , quality, framerate; the audio's format (such as PCM, ADPCM, MP3, OGG...) , volumn. 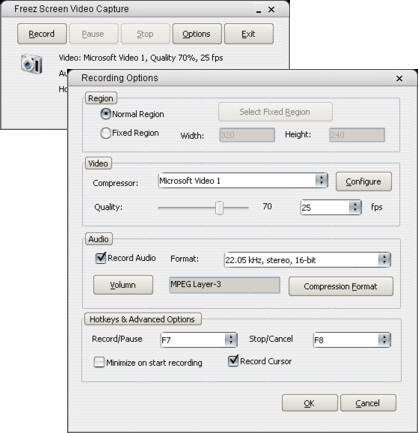 Screen Recorder tool to record screen activities and sounds into avi video file. ...... ..) , quality, framerate; the audio's format (such as PCM, ADPCM, MP3, OGG...) , volumn. And start, pause, stop screen recording with hotkeys. Use Freez Screen Video Capture to create screen demos, training videos, animated tutorials, animated presentations etc. Enjoy it. Capture any part of your screen and make professional screenshot. Qweas is providing links to Freez Screen Video Capture 1.2 as a courtesy, and makes no representations regarding Freez Screen Video Capture or any other applications or any information related thereto. Any questions, complaints or claims regarding this application Freez Screen Video Capture 1.2 must be directed to the appropriate software vendor. You may click the publisher link of Freez Screen Video Capture on the top of this page to get more details about the vendor.